This is the first in a three-part series on the onset of psychosis in young adults, its treatment and UNC’s Outreach and Support Intervention Services program. The road on which Binanay, 28, has traveled has been switchbacks and straight ahead, then around again and on. It started out rough: a congenitally troubled heart. He endured four open-heart surgeries, the first while in preschool, before graduating from Cardinal Gibbons High School in Raleigh in 2001. But that was just a thing, the heart trouble, something he was born to live with. He survived and thrived – became class president, school president, top of his class, a talented violinist. He attended Villanova University, where he made dean’s list and was elected vice president of his fraternity while earning a degree in the humanities. 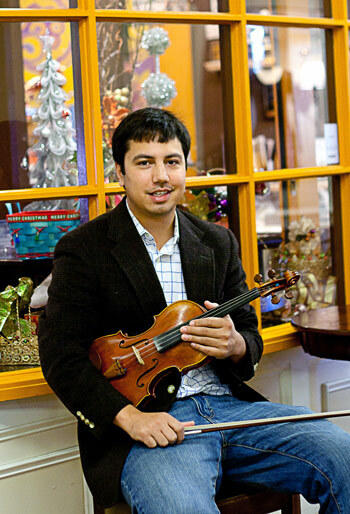 Binanay returned to the Triangle in 2006, joined a band and took a job at Chapel Hill Violins. But then it all went haywire, and in a great big hurry. Now though, something had happened, and he saw his hands – these hands that so skillfully traversed the violin – for the first time. Therapists, he says, have told him it’s plausible. Schizophrenia translates, roughly, as a “splitting of the mind.” It’s most commonly first diagnosed in older adolescence and early adulthood. There is no cure, but it’s treatable, especially if confronted early. Binanay had known success his entire life. He’d performed with the Raleigh Boychoir in Carnegie Hall and at the White House, done well in school and been popular. He wanted it to stop, and he didn’t. He was institutionalized for the first time. Medication became a part of his life – a source of dispute with his parents – on and off the meds. They dulled his senses, for better and for worse, to his mind. “Everything that I was seeing and everything that I was hearing was confirming this spiritual experience,” he recalls. Binanay pauses in conversation, and listens. A train whistle’s blowing, and it triggers a memory. “I’d be at a barbershop, and we’d hear a train, and they’d be, like, ‘That’s an old one.’ Like, it’s an old spirit. “In our book, we relate what we know and hear and see – in our book of life. Everything we see, everything we hear, everything we touch, everything we feel – that’s my book of life. He had awoken to schizophrenia, and had seen his hands for the first time. He was listening, feeling, for the first time. So too were his parents, who stood by him throughout. Compliance with his meds came in fits and starts, and eventually took hold. His mind was split open, and he was coming from a place in the heart. His work with OASIS had begun. “Awakening to what life’s about” is a beautiful story about a young man I am proud to have as a nephew. This article is brilliant, thank you for sharing your experiences in such a poetic way. More people need to hear about this, and to know they aren’t alone, so thank you again!